Since macOS 10.14 (Mojave), access to the data must be explicitly allowed. For example, for Back-In-Time can access the Time Machine data or Tri-BACKUP can save your data. 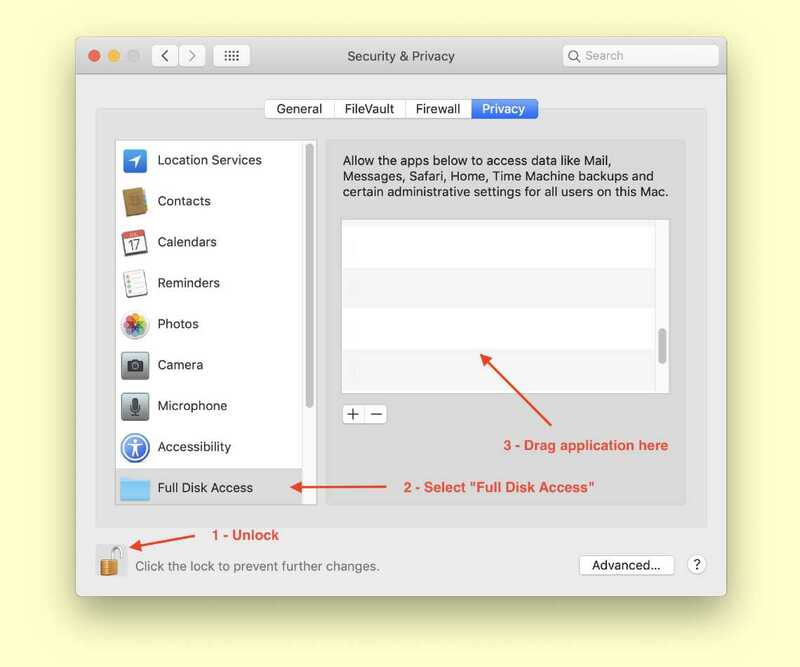 For this, open the System Preferences (Apple menu) and select "Security and Privacy". In the "Privacy" tab, you can add the applications that you allow to access for each kind of data. Select "Full Disk Access" and add Back-In-Time and Tri-BACKUP. Some applications use multiple processes, and each one could need to be allowed. In this case, the application has its own interface. Follow the instructions carefully. - Tri-BACKUP and Clone X for "Full Disk Access" (to be able to copy all of your data). - Back-In-Time for "Full Disk Access" (to access Time Machine backups). - Tri-CATALOG for "Full Disk Access" (if you want to catalog the Photos data base folder and others). - Tap-tap for "Full Disk Access" (so that it can find your contacts, URLs, etc. ).